Trimpro Rotor Med Trimmer - ON SALE! - FREE Shipping! Designed to meet even the toughest most rigorous standards for sterilization and waste management, the new TRIMPRO ROTOR MED delivers the high-quality trimming and operational ease your business needs to maintain production at peak efficiency! TRIMPRO ROTOR MED is designed specifically to meet high regulatory demands, with its medical equipment component compliancy, easy and rapid disassembly and assembly, and unique waste management and control characteristics. 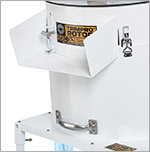 Purpose-built to meet medical industry standards and CSA approved, the TRIMPRO ROTOR MED is designed and engineered to ensure operational ease and efficiency. Each unit is easy to disassemble for sterilization and is just as quickly reassembled, for minimized downtime. The flexible fingers are steam and alcohol resistant. The blade is made from tempered stainless steel and all connectors and attachments of stainless steel. White surfaces are finished with medical standard paint. The Plexiglas™ hood ensures debris-free operation. 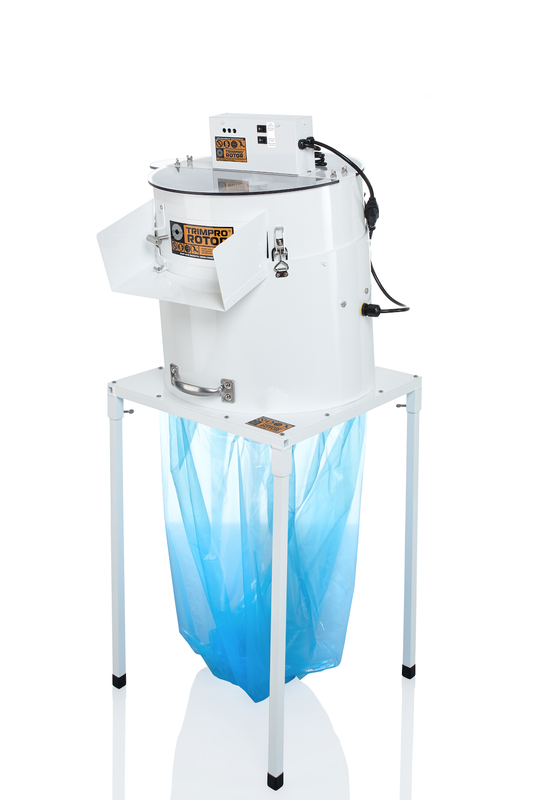 With no vacuum component, waste management and cleaning are greatly simplified, further assisted by standard weight, easily removed and sealed square trim-bags. Employing leather fingers to circulate your flowers over the non-stick grate, the leaves are trimmed by the razor sharp tempered steel blades. Built at an angle, emptying the Rotor is as simple as swinging the latch to open the door and your perfectly trimmed flowers gently exit the upper cylinder, all while the machine is still running so production is non-stop. As with all Trimpro machines, the blade height is adjustableto meet every preference. For trimming, separate the fresh flowers from the branches, put them into the upper container of the trimmer and let the Rotor do the rest. The gloves have to be tight enough so they don't get inside the grate slots. A loose glove is dangerous. BE AWARE!